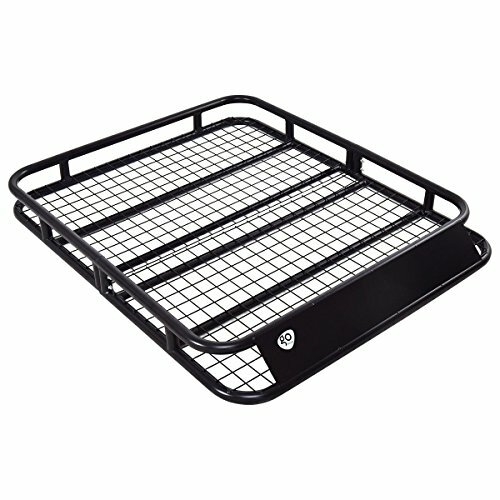 This large heavy duty steel roof rack basket is perfect for transporting objects on the roof of the vehicle without reducing interior space for occupants, or the cargo area volume limits. It is perfect for carrying bulky items such as luggage, bicycles, canoes, kayaks, skis, or extra luggage, camping equipment, cargo bags. Equipped with steel wind guard that prevents vibrations and noises cause by wind. With the steel construction and the 5" tall basket design, it provides extra stability keeping your cargo in place and secure during driving. With this roof rack, you no longer have to compromise between comfort and cargo. Don't hesitate to buy it now ! Suitable for most vehicles. Large, multi-sport basket for roof rack, carry anything you want in your vehicle. Accommodating square cross bars and roof side rails up to 2.4inch wide x 1.6 inch thick or the round up to 1.6 inch in diameter. 【Heavy-Duty Construction】This Goplus roof rack is made of premium steel. The capacity of this roof basket is up to 220lbs. Black powder coated finish enhances corrosion resistance. Steel wind fairing decreases wind resistance and noise. 【Securing Design】5" tall side rails keep cargo in place. Bottom metal nets and side rails help keeping your belongings in place while providing plenty of tie down points. 【Item Dimensions】Product size :48''X39''X5''(L x W x H). Accommodating square cross bars and roof side rails up to 2.4inch wide x 1.6 inch thick or the round up to 1.6 inch in diameter. 【Easy to Install】This roof rack is designed to easy to install, direct clamp-on desired position without modification. Can be mounted on the cross bars or roof side rails. 【Many Applications】Suitable for most vehicles. Large, multi-sport basket for roof rack, carry anything you want in your vehicle. Great ideal for camping equipment, hauling extra cargo bags, luggage and more.